Well, looks like I’ve done it again. One more car added to the stable, one bucket list item crossed off the list. Like many of us car nuts, I’ve always been in love with the 1955 – 1957 Ford Thunderbirds. Of course, I really like the “squarebirds” too (1958 – 1960 Thunderbirds) – but the ’55 – ’57 T-birds are in another class by themselves! I even started a file to help push me along the path of acquiring one of these timeless beauties. That file is dated 1998 (it’s now July, 2018)! In 20 years of career, kids, family and all the other great parts of modern life, I had set aside the dream of a Thunderbird for me. Now, I figured, it’s my turn. Realizing that procrastination was getting me nowhere, and my excuses for not making a leap were insane, I started looking for a 1955, a 1956 or a 1957 Thunderbird about 6 months ago. 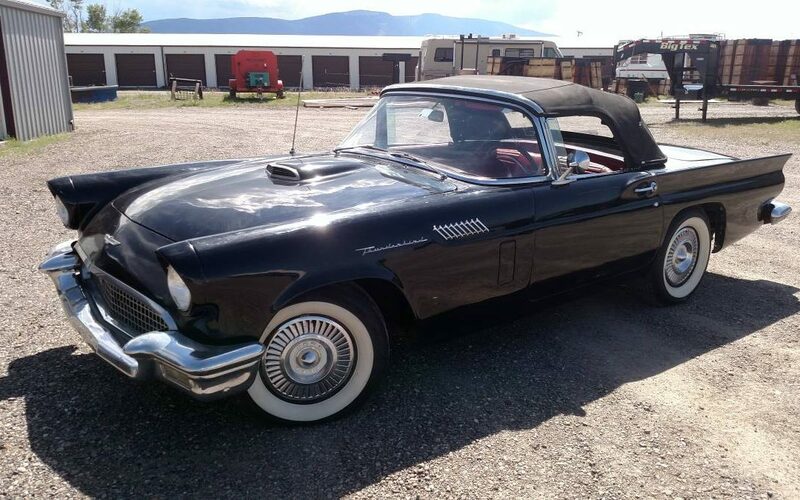 Truth be told, I might have been happy with a 1960 “Squarebird.” But, I figured as of recent, I would probably have to invest the same amount of time and energy restoring a lesser T-bird (if there is such an animal), so might as well shoot for the stars and get EXACTLY what I wanted. I had some basic requirements, but year and condition were definitely fungible. The Thunderbird had to have both tops. As I learned, there is a huge value loss when only one top is present – up to $6,000 each according to Hagerty. Many of the less expensive ‘Birds I saw were missing one or the other (usually the soft top). Yes, you can find them on eBay, but the supply is extremely limited and they just don’t come up for sale too often.Plus, if you’re buying in a far-away city, it’s not wise to purchase without a personal inspection. It had to have power steering and power brakes. IMHO, these options are non-negotiable. Of course, you can add them to a car, but that can be very expensive. I saw only one such sale for a power steering set up on eBay for over $2,500. Again, the cars lacking these options were usually among the cheaper cars. Plus, who wants a pleasure car that you have to muscle around? Automatic transmission was mandatory. Maybe I’m turning into a fuddy-duddy, but I didn’t want the complexity & inconvenience of a do-it-yourself shifter. Heck, I’m all for manual transmissions – I learned to drive in a 1961 VW Bug – but I didn’t want one here. Once again, the lower priced cars usually had manual transmissions. Note: if you do get a manual, try and get the overdrive. That is definitely a good thing. I didn’t want a modified car. There are lots of early 2-seat Thunderbirds out there with different engines and transmissions. I wanted one that was as original as possible – no modern retrofits. So, I started scouring craigslist.org and several of the online vintage car magazines. I set a budget purchase price, but realized that I might have go a little above that if I found one that I liked. I started looking in earnest in the Fall of 2017. I did see a few over the months. Mostly some pretty scraggly examples that were missing at least one of my required pieces of equipment. Most were wildly (IMHO) overpriced. One was a 20 year-old barn find 1955 that needed a lot of work to be road-ready, and still priced at the top of my budget. Most were in Denver or thereabouts. So I just passed them by. One in particular caught my attention in May of 2018 – a red 1955 Thunderbird located in Casper, Wyoming. Casper is about 5 hours North of Colorado Springs, and I figured it would be a full day of driving to see it. I whined a little at that as well – 10 hours of driving time just to see a car! Waaa! It sounded great – rebuilt engine, good body & new interior. One problem – price was way out of my price range. But, I figured I should check it out. I contacted the owner, a retired couple, and we discussed the car. It sounded pretty nice. Eventually, it was May – time for vacation! But, right before we left for 3 days at The Henry Ford Museum and a week at a Lake Cottage in Michigan, I saw a black 1957 Thunderbird that was located in Livingston, Montana. About 11 hours from Colorado Springs, it was at the tippy-top of my price range. Bot, it was a 1957 Tbird (the EXACT year I dreamed about) and ticked all the boxes for equipment & condition – both roofs, fender skirts, PS, PB and automatic, plus it was a D code car – meaning it had (originally) a 312 cu. in. engine with 245 hp! And, even though the owner said it had been in storage for over 5 years, it looked complete and relatively un-molested. This was definitely a contender, but had 2 big strikes. It was over my top budget price. Next: The trip to Montana, the purchase and the trip home in my next post! I wanted to include a link to a great blog by Chris at riseofthethunderbird.wordpress.com. He really inspired me to purchase my Thunderbird, and with his many detailed how-to posts, has made me want to document my fixes and restoration on my glamorous “Bird as well. This is a MUST read for anyone owning or restoring any old car or truck, as it shows how dedication and hard work can overcome just about anything. Thanks Chris! Here’s me and my neighbor unloading the Thunderbird!